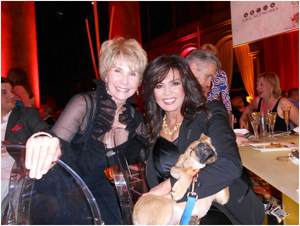 the honorary chairwoman of Fashion for Paws, with her dog, George. Doggie treats may seem like unusual party favors. They were entirely appropriate for the sixth annual Fashion for Paws, a show benefiting the Washington Humane Society. Audi AG (NSU), a sponsor of the event, parked a sleek model outside the National Building Museum. Nearby a four-legged friend named Treasure frolicked on the red carpet. The April 14 event drew 1,700 guests including Melanie Frank, international trade counsel at Hughes, Hubbard Reed (1218L) (1218L), and Mark Drapeau, Microsoft Corp. director of innovative engagement, public sector. After her remarks, Osmond returned to her table -- most of the tables were decorated with a floral centerpiece in the shape of a canine. Her rescued dog, George, rested in her lap. Dozens of Washingtonians walked the runway in fashions provided by the shops at Tysons Galleria. At their side were pooches from the Washington Humane Society shelter eager to be adopted, or their own dogs. The models played up to the bright glare of the cameras and the wild energy of the audience. The canines, many bedecked in dazzling accessories, trotted along. Aba Kwawu, the producer of Fashion for Paws, said volunteer models had to raise a certain figure to be included in the show. Those who reached “supermodel” status, raising at least $10,000, earned the privilege of selecting their own designer. Others were basically at Kwawu’s mercy. After the show, model Philippe Cousteau, the president of EarthEcho International, visited the VIP section with his girlfriend, Ashlan Gorse, the E! News anchor and host of Fashion for Paws. Both Cousteau and Gorse, in azure blue ensembles by Elie Tahari, displayed almost parental affection when talking about Gorse’s dog, a Siberian Husky named Aurora. Cousteau showed off pictures of Aurora on his mobile phone, while Gorse spoke of saving creatures like Aurora from shelters. The VIP section turned into a party of its own with Moet & Chandon Champagne, Georgetown cupcakes and a dance floor with pulsating tunes from musical host Seyhan Duru. Lisa LaFontaine, the president and chief executive of the Washington Humane Society, said the event would raise almost $700,000. Today’s Muse highlights: Scott Reyburn reports on a Ferrari auction; Elin McCoy reviews the new Bordeaux vintage.